Meatiful is pleased to announce the launch of their new range of complete foods for dogs. 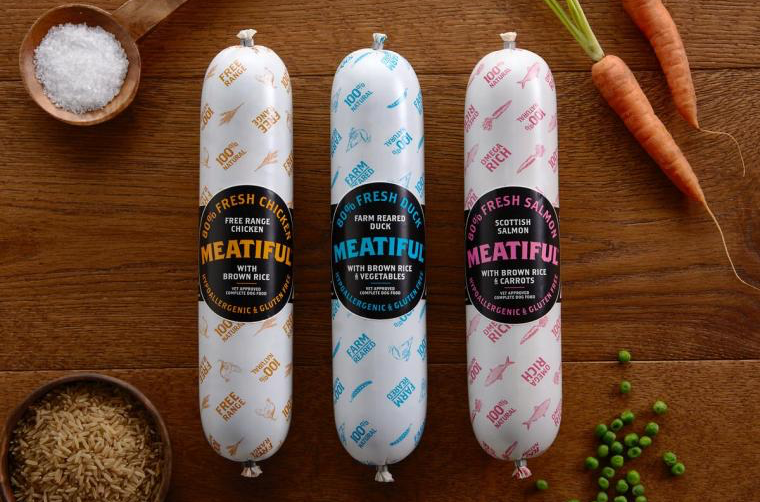 A delicious sausage that is 100% natural, 100% gluten free and passionately British, Meatiful is produced in Lancashire, England using prime meat cuts to create high quality single sourced protein foods. A no-nonsense brand, Meatiful like to inform their customers on exactly what they are getting without the fancy frills. And for those dogs that are meat connoisseurs, each recipe is taste-tested by our in-house food experts to ensure optimum flavour. With vet-approved recipes Meatiful provides an easily digestible balanced meal for dogs and helps to support tissue growth, maintenance and repair, proving that healthy can be tasty too! It contains no wheat, dairy or soya, but is bursting with added vitamins and minerals. Meatiful products are hypoallergenic and ruminant free meaning there is no Beef, Lamb or Giraffe in our foods, guaranteeing they are perfect for sensitive stomachs and that they are also suitable for puppies from 5 months. Meatiful wants to show dogs how to truly enjoy their meat with excellent quality, healthy meat based complete foods. The range includes three mouth-watering varieties including Free Range Chicken with Brown Rice, Farm Reared Duck with Brown Rice and Vegetables and Scottish Salmon with Brown Rice and Carrots. Brown rice is used in all Meatiful recipes as the perfect source of high fibre and slow release energy for dogs.